As we stated in our last post when the S&P 500 was trading around 1,800 the market had yet hit an overbought level and no definitive sell signal has been signaled. At this juncture our members have caught the last 420 S&P 500 points and we want to protect profits. The last Buy signal was generated at 1,683 and we started to scale back at approaching overbought at 1,770. We have highlighted the below data throughout the year as the S&P 500 becomes overbought. Many of you have seen this information before. Below are the most overbought markets in the last 19 years and how they performed 30 days later. As you can see, you will get some mean reversion, but the pull backs are shallow as the stronger the market the behavior of the bulls want to buy the dips. As we mentioned yesterday, we would reduce more long exposure on rally’s as the overbought level is very close. We still don’t expect a large pull back as you can reference below, the extremely strong and overbought markets have slow pullbacks. Here is how the S&P 500 performed 30 days following these readings. Don’t forget to get 14 days free without a credit card! 4 Names we are watching closely. Reminder, most of these names are either overbought or extremely overbought. So wait for a pull back. MA – MasterCard is overbought. 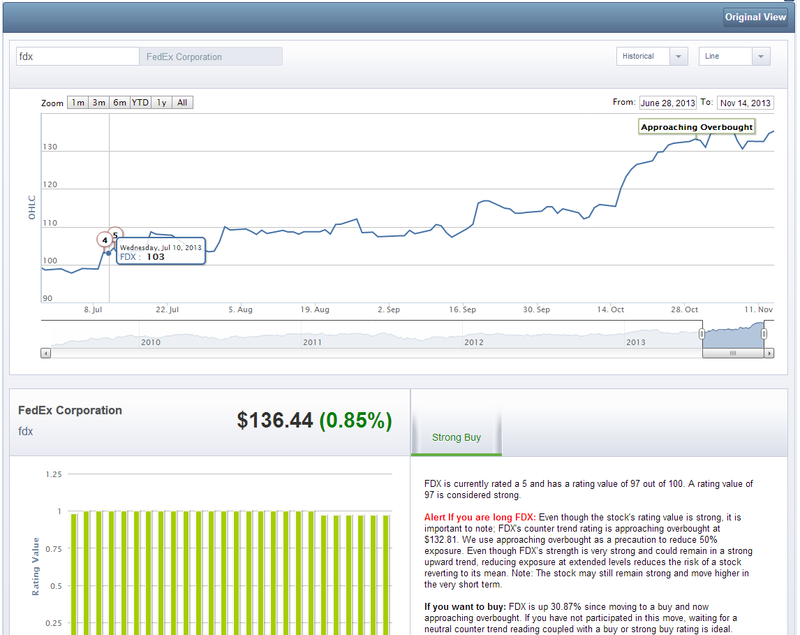 Seems like an easy call now, but we first went to a Strong Buy Sept 2012 at $453.70 (see below). With a broad S&P 500 5% to 7% pullback we will be looking to allocate capital to MA as long as the Rating Value holds above the S&P 500. Of course all bets are off if MA has a negative earnings catalyst or is downgraded in our proprietary rating. For those who are new to ChartLabPro.com ratings. 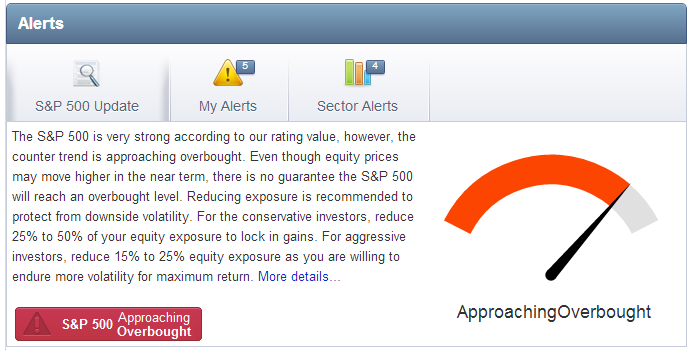 We have a 1 to 5 buy sell rating, 1 (Strong Sell) 5 (Strong Buy). You can see the rating key below on the top right. We also break down the ratings on a granular level. You will notice the sector bars below are being displayed on a granular level. .60 to a 1.00 is a Strong Buy with a 1.00 being the strongest of the 5’s. 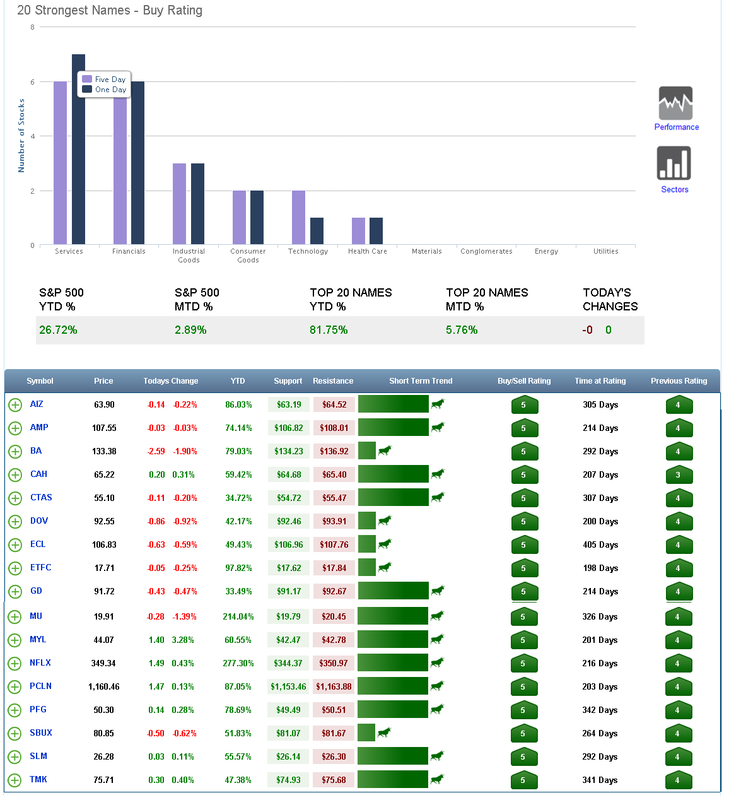 Below you will find the 5 strongest and weakest stocks in the Industrial, Material and Healthcare Sectors. As the S&P 500 becomes approaching overbought based on our proprietary counter trend indicator we will now wait for an overbought level. 10 out of the 13 last approaching overbought levels have proceeded to our overbought level. Of course there is no guarantee the S&P 500 will become overbought. If we reach our proprietary overbought level, we will look for a slight reversion to the shorter term mean in this longer term bull run. We believe 2014 will be a stock pickers market as the Fed reduces liquidity. This will cause more divergence between stocks within their respected groups. So, we want to look for the Strongest Stocks within the S&P 500. 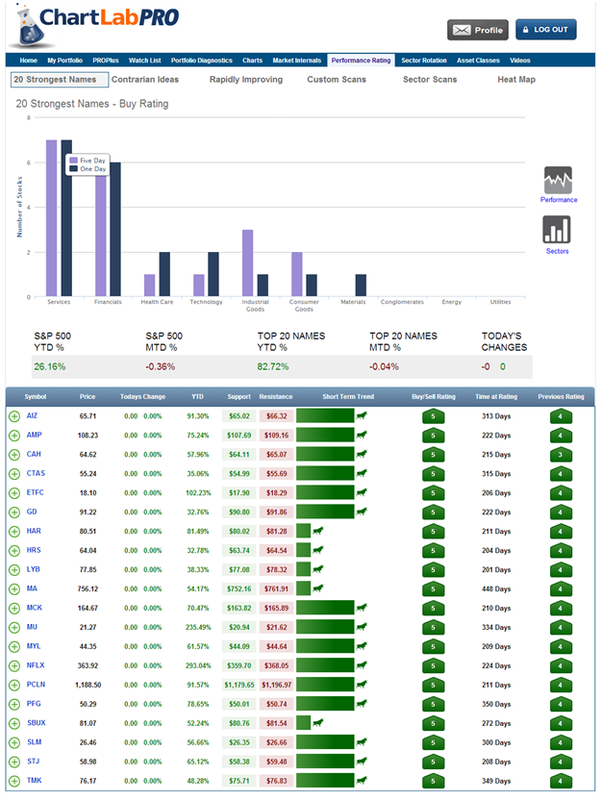 Below are currently the Strongest 20 Stocks within the S&P 500 based on our proprietary rating system. UPDATE: Same theme for the last five weeks- Move up the trailing protective profit sell stop as bullish price action continues to dictate the overall profile of the Index. Last week, we also stated, “Keep in mind the bullish cycle of this move could wane toward 1825.00. The upside is limited at this juncture”. Since moving to the Strong Buy at 1,683 on the S&P 500, we said a move to 1,825 was likely. We would reduce exposure at either 1,825 or an overbought level. These are not bearish sells, just proactive risk management. Remember, we are not trying to call market tops or bottoms, we are just trying to proactively manage risk. For those of you who have been with us for the entire 2013, we have caught almost 400 S&P 500 points and we are going to defend this gain even if we have not hit the official overbought level. 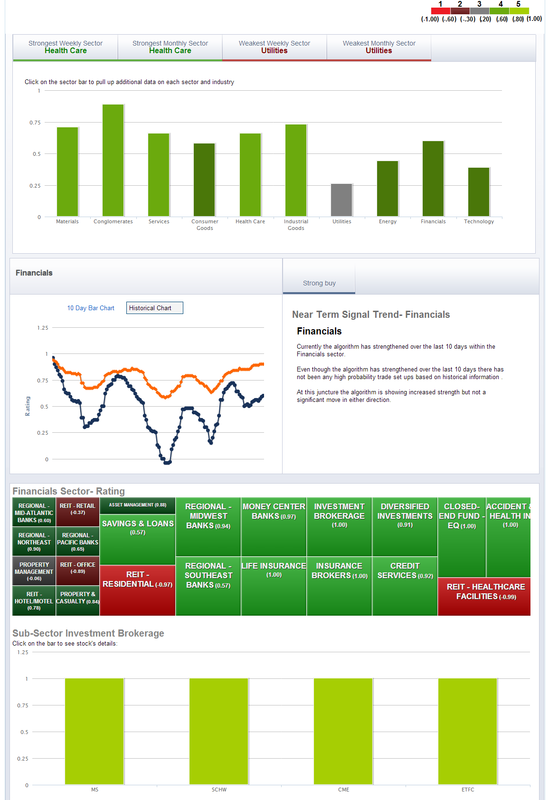 We wanted to update readers on ChartLabPro’s countertrend reading for the S&P 500. We are currently reading an Approaching Overbought S&P 500 and yet to reach overbought. 10 out of the last 13 Approaching Overbought markets have researched an Overbought level. As we approach the year end stretch many of you will want to watch for the Strongest names as it looks like a year end melt up is in the cards. Quarterly Filings are hitting the Street. 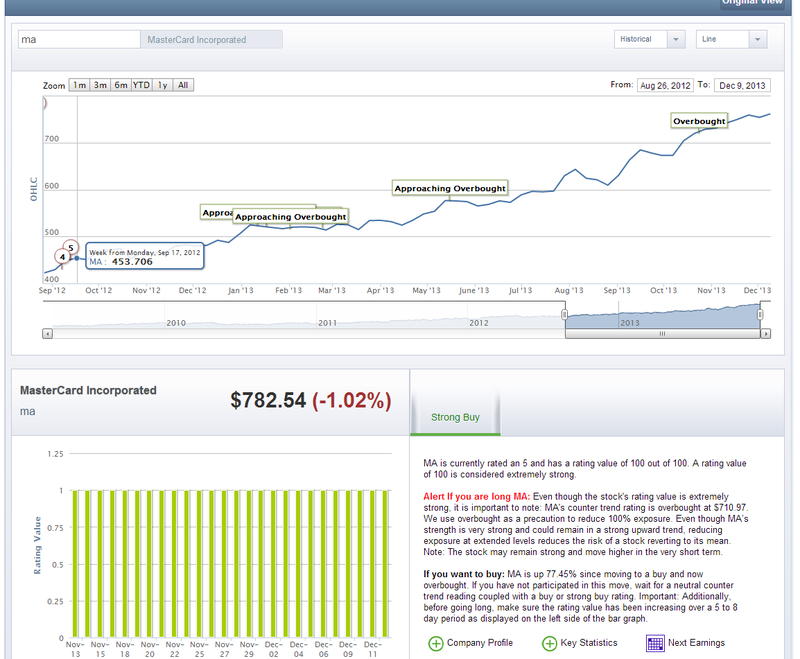 George Soros’s family office picked up 1,515,730 and 375,000 shares in call options in FedEx. Daniel Loeb revealed that he had snapped up a new position in FedEx as well, his fund ThirdPiont owns 2 million shares. ChartLabPro.com sent to a Strong Buy in July at $103 and now is approaching overbought. Be careful if you are chasing this one as it is now up 30% in a short period. Quarterly Filings are hitting the Street and David Tepper reported t a position in J.C. Penny. JCP is trading up 5% today as the herd mentality rushes into this name. Question, do you think the Smart Money (David Tepper) is going to stay long after a 40% return in less than 4 weeks? Don’t follow the herd and get slaughtered with the pack. Since he bought the stock the stock is up over 30% and since the 13 F, he was publically stated as saying he sold the stock. This is what you call stale information.